Political,economic and social stresses take their toll on normative behavior. The late “early modern period” let’s call it 1590-1680 (pre Newton?) was a period of hegemonic disillusion, simultaneously there was an ‘outbreak’ or interpretation of behavior as aberrant and named Enthusiasme characterize by those who were thought guilty of feigned inspiration, impostures, sectarianism, and extremes of religious passion. Enthusiasm was also associated with sets of physical symptoms—convulsions, ecstatic dancing, prophesying, speaking in foreign tongues. The England of Burton and Casaubon, the two authors who dedicated a great amount of scholarship to Enthusiame was very different, Burton died (1640) before The Death of Charles I . Causaubon’s book was published in the period between the execution of King Charles 1st in 1649, and the restoration of Charles 2nd in 1660. At this time, religious sects were multiplying profusely and their conflicting demands for a restructuring of society were a threat to political stability in England. The investigation of the etiology of what was regarded as a religious distemper,ceased to be operative in theological or political terms. This insufficiency inspired a great mind such as Casaubon to look for a better ( and maybe more peaceful) understanding of these behaviors. In Casaubon’s etiological journey he sets out to impose on general Enthusiasme, distinctions, and specific causes for each of these. He stipulates that some types can arise from mental abnormalities without supernatural intervention. In this view Casaubon is investigating mental illness. 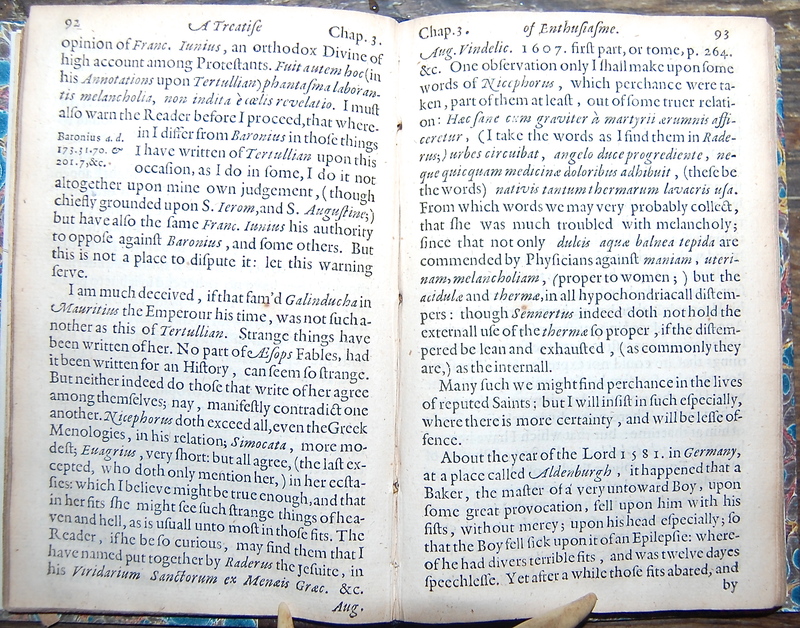 A Treatise Concerning Enthusiasme, As It is an Effect of Nature: but is mistaken by many for either Divine Inspiration, or Diabolicall Possession. By Meric Casaubon, D.D. 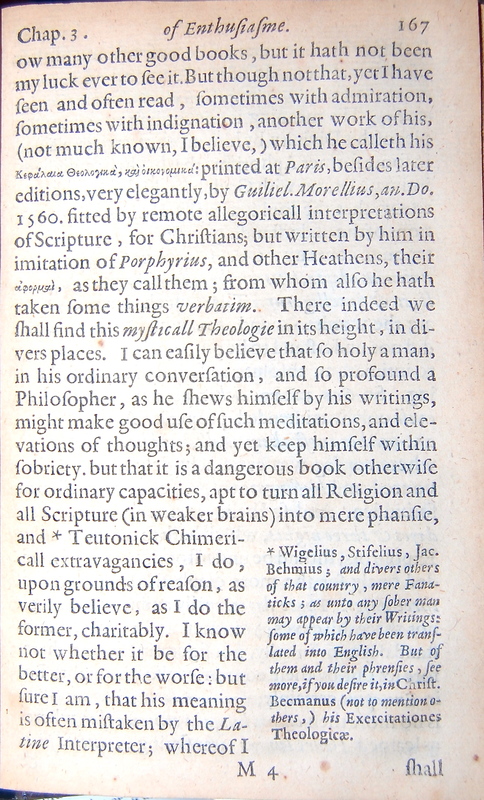 Second edition: revised, and enlarged. Ocatvo, 6.4 x 4.2 inches. Second edition. A-T8, V6. 297 pages. This is a good copy in a later quarter calf binding. 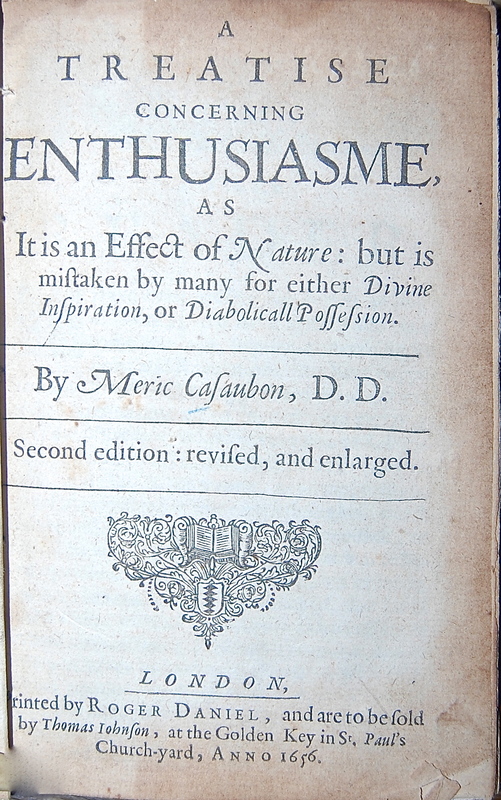 “ ‘A Treatise Concerning Enthusiasm,’ was an enlightened work since in it Casaubon set out to show how various enthusiasms, such as ‘divinatory,’ ‘contemplative,’ ‘rhetorical,’ ‘precatory,’ and others could arise from mental abnormalities without supernatural intervention or imposture. Read today in this sense it was a psychiatric treatise devoted to mental illness with religious coloring and the special problems raised by it. 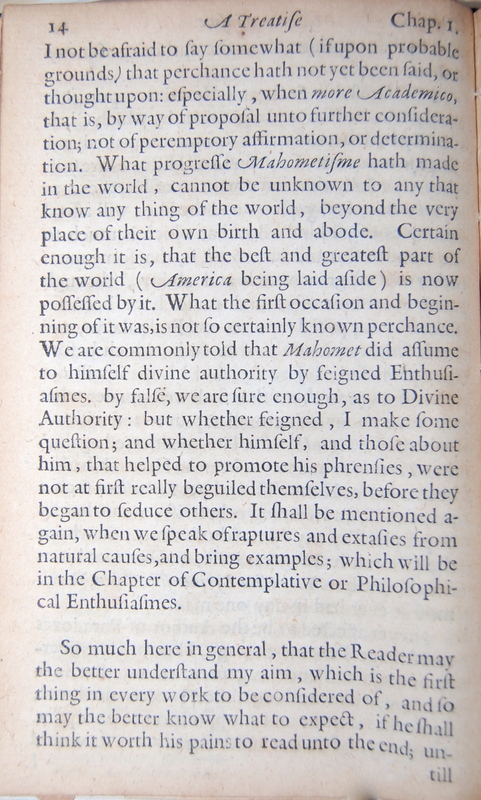 The first extract shows how epileptic phenomena in particular made it difficult to accept all mental illness as ‘natural.’ This was partly because of the dramatic effect of sudden, short-lived, episodic disturbances of consciousness accompanied by convulsions in otherwise normal persons which had given epilepsy its popular name of sacred disease and rise to Hippocrates’s famous pronouncement: ‘it appears to me to be nowise more divine nor more sacred than other diseases, but has a natural cause from which it originates like other affections. Men regard its nature and cause as divine from ignorance and wonder, because it is not at all like to other diseases.’ Another difficulty was that persons suffering from minor epileptic conditions such as temporal lobe disturbances with twilight, dreamy or confusional states — surprisingly known to Casaubon and called by him ‘a more gentle and remiss kind of Epilepsie’ — often report hallucinatory experiences as of another world. These are sometimes elaborated into delusional systems on religious themes. — ‘for it is natural to those that have been epileptical to fall into melancholy’ — especially if repetition of vivid experience perhaps reinforced by a feeling of reminiscence or deja vu has convinced the patient of direct contact with superior powers. A third difficulty was the overzeal in religious matters or religiosity which is a common manifestation of epileptic personality change. Wing C-813. Please see Heyd, Michael. “Be Sober and Reasonable”: The Critique of Enthusiasm in the Seventeenth and Early Eighteenth Centuries. Leiden, 1995. Argues that reactions against enthusiasm provide important background to the Enlightenment.